Motion-sensing illumination in three easy modes: ON, OFF and AUTO. Set the LED nightlight for AUTO mode and it instantly illuminates the nightlight when detecting motion from as far as 3 meters away within 120 degree. If no motion is detected for 15 seconds, the light will automatically shut off, which saves energy and conserves the battery. Portable & Handy Design: The nightlight can be removed from the mounting plate and used as a flashlight if needed. Bright ambient lighting: 10 LEDs emit a bright strong glow in the dark, yet the frosted lampshade design evenly diffuses the light, to create warm ambient light and prevent harsh blinding effects. 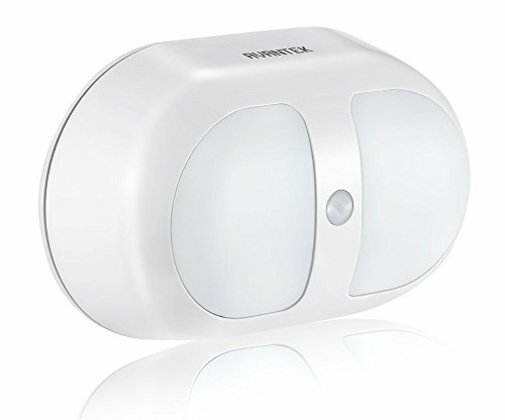 Versatile and simple installation:This nightlight runs on 3 x AA batteries (not included) and comes with two 3M double-sided adhesive pads.This simple installation requires no wiring or electrical connection. It can be attached to hallways, stairways, steps, bathrooms, bedrooms, closets and more. Reliable and friendly customer service: Our customer service team is ready to respond to your questions or inquiries within 24 hours. You'll have peace of mind with our 30-day money back guarantee, 12-month replacement warranty, and lifetime support.